Finally, a real MSX computer. Very nice little system. You can hook it up to a dual floppy drive unit, very convenient. It can even read low density IBM disks. (Very handy for tranferring programs from the net.) The DOS is very similar to PC-based DOS, and it runs MS Basic, or course. This particular model was made for the Korean market. The keyboard and OS can handle both English and Korean characters. The instruction manuals are fun to look at because most of the text is in Korean, but keywords and programming examples are in English. Of course, it has the same gorgeous extended Basic that all MSX machines shared, as well as the great graphics. The funky blue cursor keys. All computers should have keys like this. 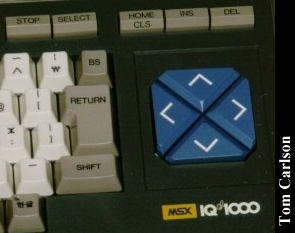 The logo for the IQ-1000 has a little thumbs-up in between the "IQ" and the "1000". Close-up of the cool blue cursor keys. 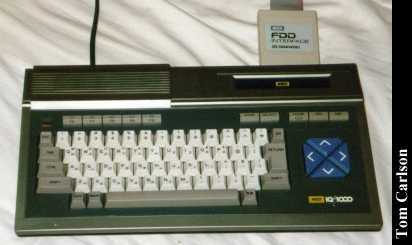 Front view of the main IQ-1000 unit, with its dual floppy drive unit. Rear view, showing the various ports. The multi-pin ports, e.g. the floppy port, have little grippers on each end that firmly hold the cable once it's plugged in. Click here to view all comments for the Daewoo IQ-1000 and to leave your own. Click here to view comments about other Daewoo computers.